Today I am most proud to report that the work-out-at-home (or wherever I happen to be) experiment is going well. I'm now 4 for 4 in attempts at getting up early enough to make it happen -- so even though the workouts have been shorter than desired, I'm feeling good. I thought about calling this post 'Scary Hotel Gym,' but it wasn't the gym so much as the gym-goers that made yesterday's workout so frightening. Frightening, though, in a good way, because, at 5:55 a.m., I practically had to fight for a treadmill. On my way into the gym, a woman exiting said to me, "Watch out, they're fighting in there." Seriously? Turns out she was right; I found only one open machine out of eight: a treadmill. And I hate treadmills. But I hopped on, hoping an elliptical (there were two) would open up soon. After 16 minutes of interval running/walking, an elliptical opened up. I stepped off my treadmill and, in a moment's hesitation, lost both the open elliptical and my treadmill to new gym-goers. Amazing. So I stood in line, waiting 10 minutes until the other elliptical opened up. I don't think I probably would have toughed it out, under normal circumstances -- but I've decided that workouts are just that important. And I was very, very glad I stayed. I'm feeling much, much better since posting the Dorito and Pepsi photo Monday night. There's something sweet about confession, truly. I did better yesterday. I ate a Fage before meeting a friend for breakfast, so that I was only hungry enough for one IHOP Harvest Grain pancake (instead of the four they served me). I had Pinkberry pomegranate fro-yo w/shaved milk chocolate for lunch (nutritionally devoid, I'll admit -- but substantial enough to carry me for a few hours and sweet enough to take care of the day's cravings) and In-N-Out around 4 p.m. I ate fast at In-N-Out (was in the midst of a long driving trip and wanted to get back on the road), but I stopped before finishing both burger and fries. And, since I still felt full when I got home at 9 p.m., I just had water instead of snacking. While not the most nutritious day, I controlled the damages. Today: Tiny bit of yogurt and Kashi 7 Grains for breakfast (was in a hurry), scrambled egg w/veggies and an apple for a snack at work, and healthy (no, seriously) pad Thai for lunch. Chicken ravioli coming up for dinner. 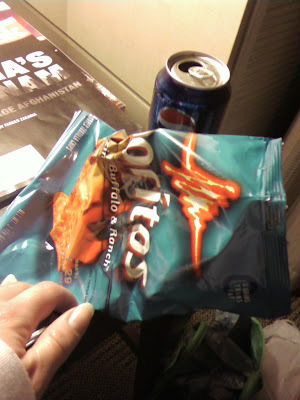 I'm making this post to remind myself of how disgusting I feel at this moment, hours after consuming both a Pepsi (150 calories, HFCS) and an entire bag of Blazin' Buffalo & Ranch Doritos (490 calories, 24.5g fat, 3g sat fat). That's right. Look at the empty packages. Remember how disgusting your stomach feels. Think about all the edamame or pretzels with peanut butter or even dark chocolate Hershey Kisses you could have eaten instead. But mostly, think about miserable it feels to be going to the gym in the morning, knowing you're working from a deficit. I went to the Presidio to run on the path I ran the 5k on in November. I had a nice run, but it only lasted about 30 minutes because I made a wrong turn early on that cut out a sizable portion of the path. By the time I got to the end, it was too long to repeat the whole thing (I needed to get home to accomplish other chores). But -- loved the trail. Planning to try this again soon. I've always wanted to do trail running -- there are tons of races in my area to train for, of all sorts of lengths. And, even better, there are tons and tons of excellent trails to run on. I caught a sideways view of my behind earlier today (i.e., I wasn't standing at my thinnest angle, the one I usually use in front of a mirror), and it was a frightening sight -- frightening enough to make me do a little experiment for counting my calories over the past week. I've been tracking my eating every other day or so during the past few weeks, so that made this a bit easier (and more honest). Thanks to the tons of online calorie data resources, I think I've been able to come up with a reasonable estimation of what I'm consuming. The results? Shocking, but in a good way that should help me cut back a bit: I'm consuming between 300 and 400 extra calories each day. Good grief! That's insane! What have I been doing? I overslept again yesterday, this time somewhat knowingly. I didn't get up until 6 a.m., but I decided to go for a run anyway and take a later-than-ideal shuttle to work so I wouldn't get off schedule. (We had planned to go to a movie last night, and I knew I wouldn't wake up in time to run today). The run, then, was short -- around 25 minutes -- but still got my day off to a good start. Running on the hills in my 'hood is fabulous -- definitely not dull in its challenges. I did it! I had a few hiccups along the way, but I did it: I worked out at home today, before work, before the sun came up. Woohoo! The stumbles: I snoozed until 5:20 a.m. and then stood in the living room, gazing out the windows, debating if I should be running outside before 6 a.m. So I didn't start running until just about 5:45, which meant I had to cut the run short (at 29 minutes) and only had time to do arm weights (I opted to run longer and skip lunges, since I'm finding cardio's most important for me in losing weight). But I can do this: If I can just get out the door by 5:15 a.m. most days, I think I'll be able to do a run, weights and lunges. Testing that on Thursday. -- My apartment's water & shower products are much nicer to my skin. -- The hills around my home provide for an awesome urban workout space -- more challenging than the flat-to-rolling trails I've been running at work. I just updated my workout calendar item to show that I'll be working out from 5 to 7 a.m. instead of 7 a.m. to 8:30 a.m. That should keep me honest and make it seem like a normal and expected affair each Tuesday and Thursday. We hiked in Muir Woods on Saturday for about two hours, on a Dipsea-joining loop of about 4 miles. I'd never been on Dipsea, so it was a nice change of pace from the somewhat-touristy main trail. This hike is steep on one end and more gently graded on the other; we chose to climb up the steep side and down the gentle side. This means we got a good 30 minutes of cardio, but after that it was a leisurely stroll, so I'm not sure it counts as much of a workout. I'm counting it anyway.